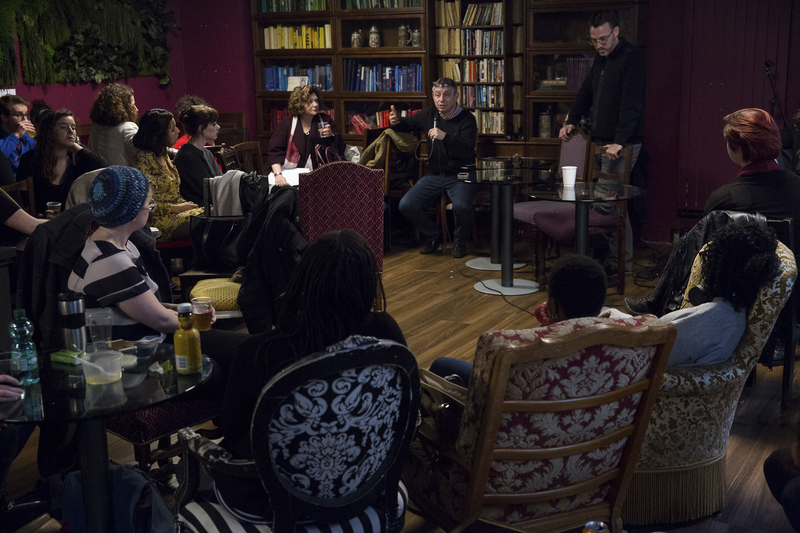 Throughout the week, three public discussions took place concerning issues surrounding the senior speaker elections and subsequent formation of a movement to create a student union at AUP. On Tuesday evening, Vice President and Dean of Student Services Marc Montheard, Dean of Student Development Kevin Fore, and AUP President Celeste Schenck hosted a town-hall style discussion in the Amex allowing students to express their concerns regarding the elections. The primary focus of this meeting was on the disqualification of senior speaker candidate Eleanor Dickinson on Friday, March 27. 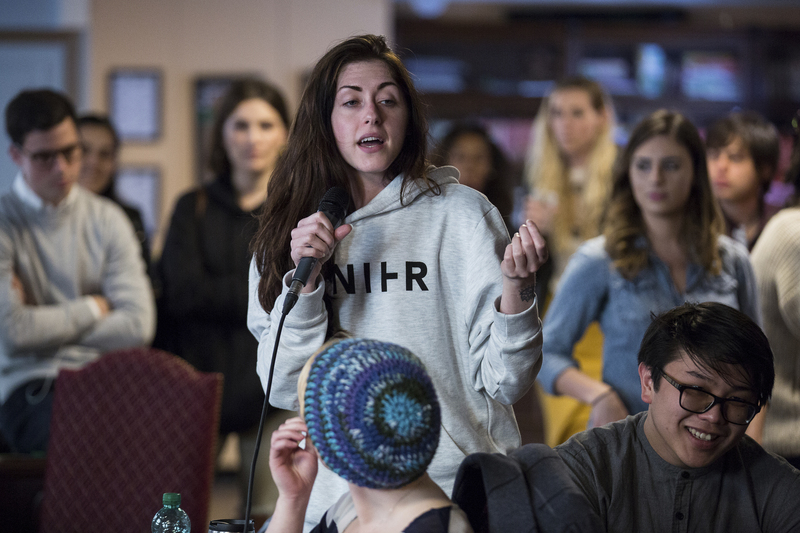 The second meeting, held by organizers of the Student Union movement, also at the Amex, took place Wednesday morning with the purpose of answering questions and concerns posed by students and administrators regarding the Student Union. The final discussion to take place addressing these issues was held during the final 30 minutes of Wednesday’s SGA Senate session. 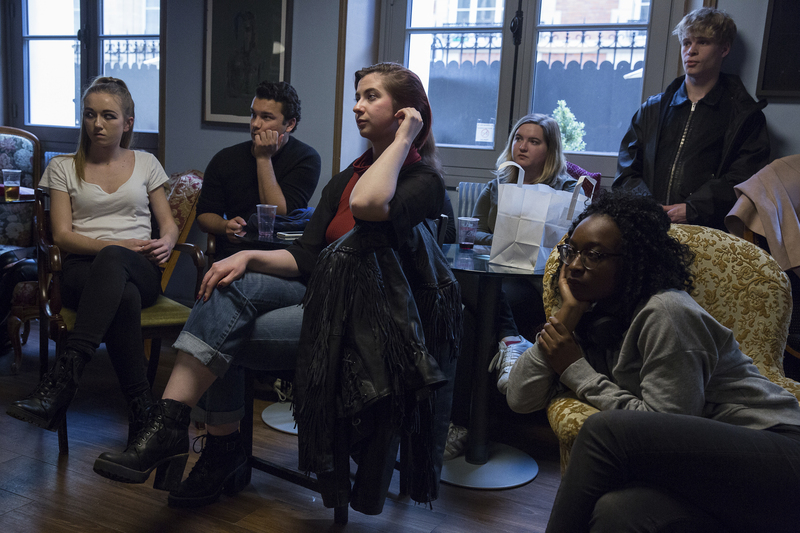 Tuesday’s discussion was the first in the line of debates which opened the floor for dialogue between students, SGA members, and AUP administration. The session began with an inquiry by GSS representative and Student Union organizer Dhouha Djerbi about why the administration chose to only send email invitations to the discussion to graduating seniors and graduates. “The main concern and the main debate goes around the graduation speaker election and the graduation speaker election is for seniors and graduates and the ceremony is for them. That's why we reached out to the seniors,” said Montheard, Vice President and Dean of Student Services. One student inquired why student voters were not notified of Dickinson’s disqualification as soon as it happened. The student also expressed concerns that in making the executive decision to disqualify a senior speaker candidate without notifying the student body, students were not being treated as adults by the administration. “It's a totally valid question and here it might have been a mistake that I made. The reason is that I wanted the vote to run its course and sending a message about the elimination in the middle without giving a lot of details would have been problematic. This is also the reason why all the results as they were cast were made public. It was not kept secret. It was just not publicized. It was definitely not in an effort to treat anybody like non-adults,” Montheard stated in response. The vice president also made a point to emphasize that the decision to disqualify Dickinson was his decision alone. “This is a decision I made. This is a decision that was not requested per se by anybody in particular. there have been some rumors, of course, with very much help from this wonderful tool called social networks,” said Montheard. He also made sure to clarify his impartiality on the matter. “I would have made that decision no matter who the candidate was. Eleanor, this is not personal,” said Montheard. French department representative and an organizer of the Student Union movement Ciat Conlin addressed his concern for the decision to allow the senior speaker elections to continue normally after Dickinson’s disqualification. “By allowing [the election] to continue, anyone who voted, their vote was essentially wasted on it. So we're not just dealing with Eleanor not being allowed to speak, whether or not you think the speech should have been given. The issue is that we're not just infringing on her rights, we're infringing on every single person who voted for her,” said Conlin. It was conceded by President Schenck, however, that there were indeed mistakes made in the manner the decision was presented to the student body. “I think we can all agree and probably Marc and Kevin and I all agree that there was something in that timing here that wasn't optimal because people didn't have enough information to be able to make their final decision," said Schenck. 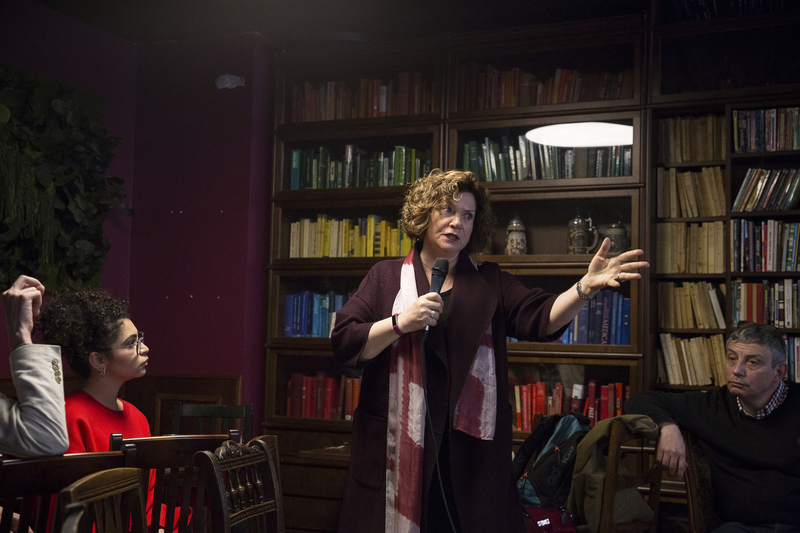 The discussion made a segue to the purpose, questions, and concerns about the creation of a Student Union during their first unofficial meeting Wednesday morning. “There seems to be confusion and ambiguity surrounding this body. I am torn to see that a lot of the students think that the Student Union will be operating as opposition to SGA. The student union is not a witch hunt directed at any student and executive positions. This is absolutely not the case,” said union organizer Dhouha Djerbi during Tuesday’s discussion. “[The Student Union] would like to assume the responsibility of offering an empathetic ear to students with legitimate complaints and making sure that these complaints are raised with the appropriate authorities and parties. Additionally, we would like to volunteer at election booths during student elections. This is not out of mistrust of the student government or the administration,” said Djerbi in a later statement made on during the Student Union meeting Wednesday morning. 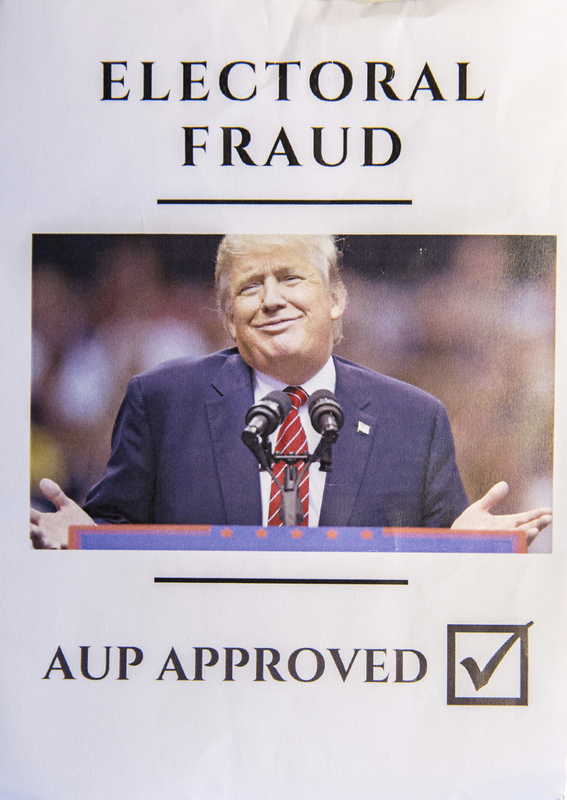 After placing flyers around AUP buildings containing inflammatory statements regarding SGA and the AUP administration, some of which Undergraduate Student Council President Amelia Harvey deemed as “offensive,” Student Union organizers walked back several of their claims. “With regard to the posters that you might have seen here on campus at the time when Eleanor was disqualified. Frankly, these were organic expressions of collective outrage and frustration provoked by the recent mismanagement of elections. I do acknowledge that the posters might have been a tad, let's just say propagandist and we're very sorry about that,” said Djerbi. “There was a lot of fiery rhetoric being thrown around by a lot of people. I personally was not aware of how offended people were getting by what we were saying by how wrong they felt. Ultimately we don't want to be a divisive body, we want to be an additional organization that does fight for the students. So, personally, I would like to apologize for all the stress this has caused people because I was not aware of it. So, sorry. If I may retract informally, we will draft a formal retraction of some of our statements,” said union organizer Knapp. 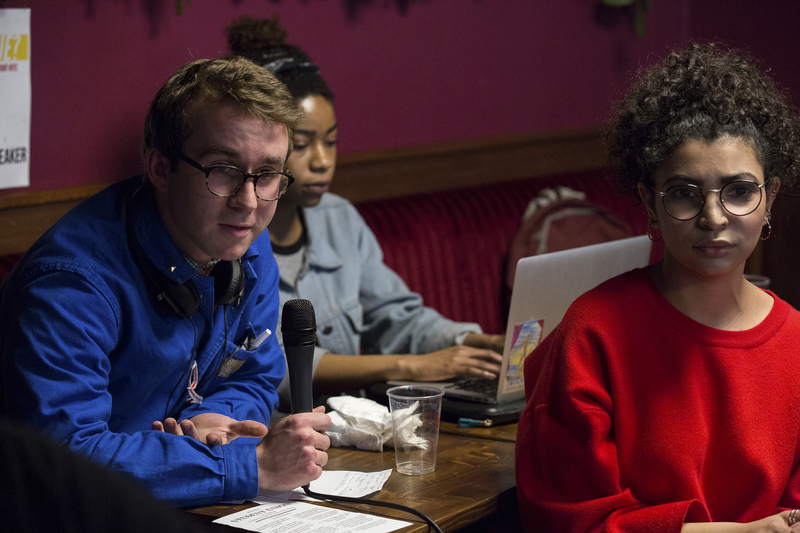 The Senate session covered a summary of the previous two discussions and created a dialogue about how SGA and AUP administration will proceed in the near future. 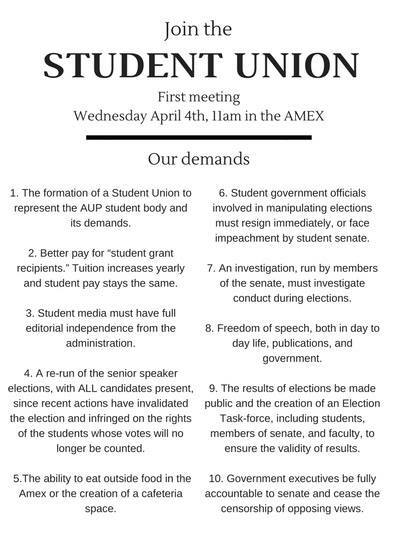 ASM Student Media Managing Editor Talia Lliteras was also in attendance during the meeting requested clarification into the statements which had been made by the Student Union organizers regarding the independence of ASM. Ciat Conlin explained that the organizers had not looked into the existing ethics guidelines of ASM or contacted any representatives from ASM before making said statements about the student media organization. “All this happened really quickly from the initial decision of the elections, with all this happening I think there is definitely some hastiness in that. The ASM thing was an error and we've retracted these things in the meeting earlier,” said Conlin. “Part of the frustration, I think on ASM's part here is that [the Student Union’s claims] confuses the idea of what ASM is. If they're bringing up a concern about the independence of a student media from the institution, what that says to me is that they don't necessarily have an idea of how ASM actually operates,” said Lliteras in a later interview. Some of the statements retracted by the Student Union remain published on their Facebook page and an official retraction has not yet been made by union organizers. On Thursday afternoon, Montheard sent an email to all SGA members proposing the formation of a legislative body which will tackle the challenge of amending the SGA constitution. “Following the meeting that took place last Tuesday and after reflection with Kevin Fore, I would like to suggest the following structure to look into the issue of re-election and to propose an amendment to the constitution to set up a clearer process in case of a need to disqualify a candidate. 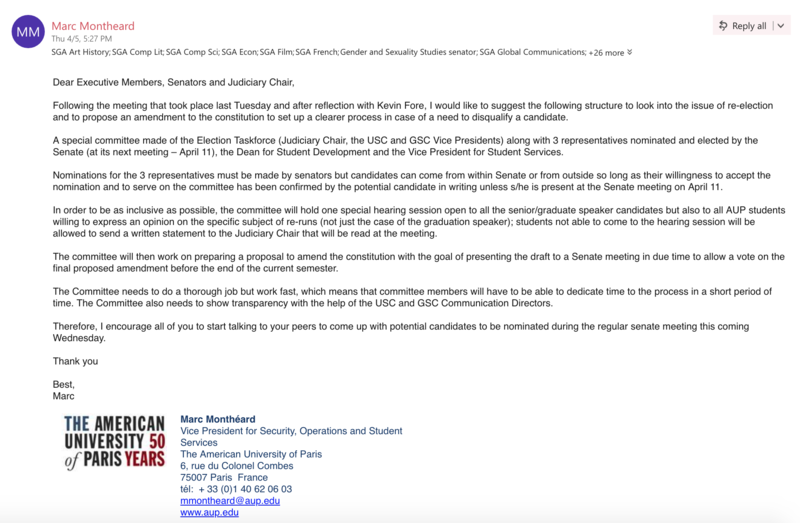 A special committee made of the Election Taskforce (Judiciary Chair, the USC, and GSC Vice Presidents) along with three representatives nominated and elected by the Senate (at its next meeting – April 11), the Dean for Student Development and the Vice President for Student Services,” Montheard wrote. 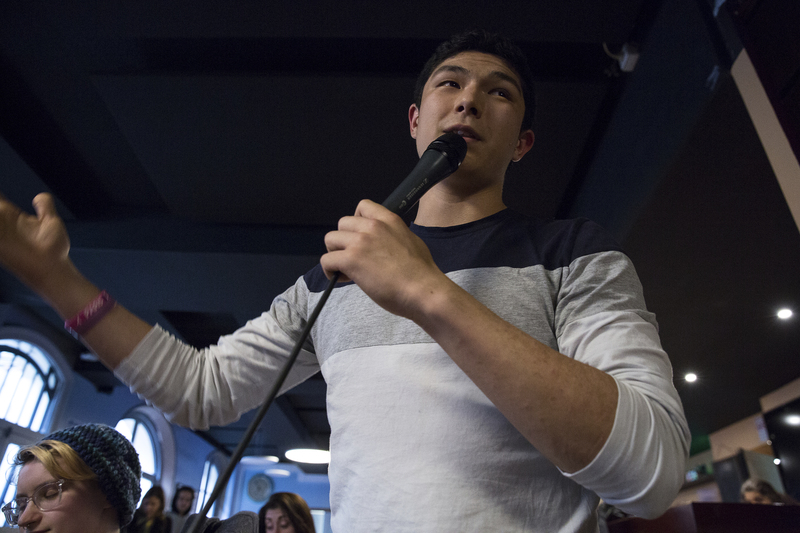 One student, Alfio Lococo, a freshman, drew a round of cheers, laughter, and applause on Thursday after singing a verse of the hit song “why can’t we be friends,” following a motivational statement about forming a new family at AUP. “I don't represent anybody. I'm just me. The thing that brought me here today was the fact that I am in my freshman year in college, this is my second semester away from home. This is my new home, this is where I live. And as cliché as it is, as often as you hear it, in your first year, you leave your family and you come to a new family, you build a new family. Whether that family is SGA or ASM or something else, some other clubs, some other groups, you find unity in school. And the fact that an issue, as important as it may be, can tear apart in such a fundamental way was so disheartening for me. In a world where everything seems to fall apart on a daily basis… It's nice to come to school and realize that, hey, there is an SGA that's united. And hey, there is an ASM that's united. And I think what I'm trying to say is, "why can't we be friends, why can't we be friends,” said Lococo.